only if option 2 chosen and paid for above, type in your personal message here. 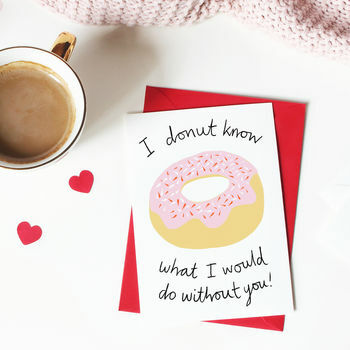 I donut know what I would do without you! Donut pun card for Valentine's Day and anniversaries. This sweet card is ideal for your boyfriend, girlfriend, husband or wife on valentines day or to celebrate an anniversary. Your beloved will love this playful pun card. Exclusive to Claire Close Studio, send a card as unique as your loved one. Copyright : WORDS AND ILLUSTRATION COPYRIGHT OF TAROT CLOSE. Option to send card direct : You can send this card direct to the recipient by selecting the options on the customise button. This is a great option if you are overseas, in a hurry or want to save on postage. Cards chosen with this option will have your message typed inside and sent in the envelope directly to the delivery address you have provided at checkout.